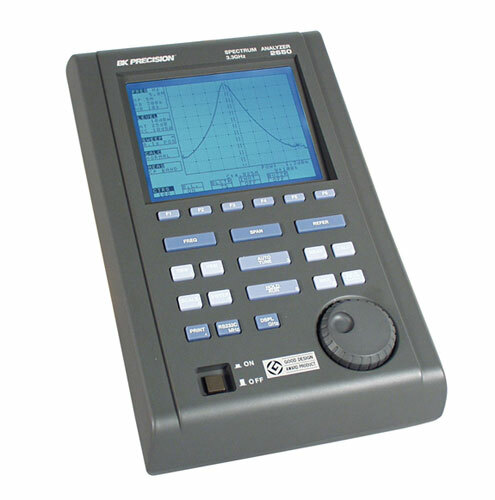 This lightweight, handheld spectrum analyzer weighs 1.8kg (4lbs) including the battery, features a large color screen, and a frequency range of 50 kHz to 3.3 GHz. The 2650 are high-performance spectrum analyzers providing excellent performance and functions perfect for many different applications. It is a compact, lightweight and inexpensive unit that is ideal for testing W-CDMA, CDMA, GSM, PDC, PHS, Wireless LAN and Bluetooth systems. There are many accessories available for the 2650 and some of them may be necessary for your application, so please view the available accessories before ordering. Included accessories are BC 2650, LC 2650, BP 2650, accessory pouch, fuse and instruction manual. The AK 2650 software and serial interface cable allows the 2650 & 2658 to display screen resolutions on a PC that are four times greater then the 250 points displayed on the horizontal axis of the 2650's LCD display. The 2650 & 2658 samples its input at 1000 points per sweep and it can output these points through its RS 232 port to a PC (the maximum transfer rate is 38,400bps). The AK 2650 not only allows for clearer screen images but it also allows spectrum analyzer setup via a PC. It is possible to measure the electric field strength by connecting one of the optional dipole antennas to the input connector. Dipole antennas that suit many uses are available. AN 301 is mainly for PDC 800MHz and GSM 900MHz bands, AN 302 is mainly for PDC 1500MHz bands, AN 303 is mainly for PHS, W-CDMA and GSM 1800/1900MHz bands, and AN 304 is mainly for 2.4GHz wireless LAN and Bluetooth bands. AN 305 is for 390MHz to 410MHz. AN 306 is for applications between 4.7GHz to 6.2GHz (802.11a & GPS). AC adapter for models 2650 & 2658. The BC 2650 accepts 100 to 240VAC, 50/60Hz and outputs through it pin jack a 5V/4A DC voltage to power the 2650 & 2650. Replacement battery for models 2650 & 2658. A fully charged battery has an approximate operation time of 100 minutes (with back light off). Leather textured carrying case with strap to carry and protect model 2650. With the PT 2650 you can print hard copies of screen images. Printing begins when the "PRINT" key is pressed. The printer can either be operated by an AC adaptor or four AA batteries. The operating time when powered by alkaline batteries is approximately 30 minutes (when used continuously), which makes it possible to produce about 80 hard copy screen images. The PT 2650 comes with one roll of paper. Order part number PX 2650 for an additional ten rolls of thermal paper.